How long were people waiting for characters at the Halloween Party? We have the first Mickey’s Not So Scary Halloween Party out of the way, so how were the lines for characters during the party? With the constant reduction in character meets and the removal of so many great villains like The Queen, Maleficent, Dr. Facilier, Tremaines, Gov. Ratcliffe, Frollo, Captain Hook and the removal of the Toy Story Dance Party the character lines keep getting longer and longer. Why they keep marching out Snow White, Tinker Bell, Buzz, Merida, Ariel, Cinderella, Aurora, Tiana, Rapunzel, Alice, Mad Hatter etc with no unique costuming boggles the mind. Just meet those characters during the daytime, there’s nothing “special” about the “special event” when you do the same things. When you limit the number of characters that can be met and then combine characters that are rare like Queen of Hearts and Tweedles, you increase the average wait for the characters that guests can’t usually meet. For me personally, there’s nothing new to experience at the party this year. Belle and Gaston would make a nice photo as does Queen and Tweedles, but there’s no new characters. 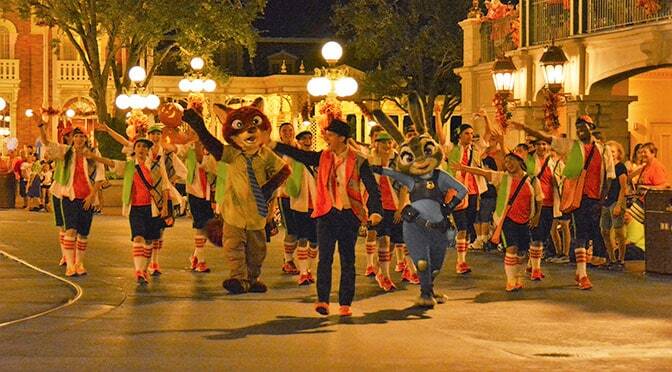 Nick and Judy were added, but only in a street dance party. It seems that some of that could be alieviated by splitting up Queen of Hearts and Tweedles. Queen of Hearts was like a 15 to 20 minute meet last year and it’s MUCH higher with Tweedles added. I’ll share an opinion that will not be popular and my kids would have hung me in effigy when they were kids, but characters with long lines like the Queen of Hearts shouldn’t be signing autographs. I beleive that WDW should offer the pre-signed cards for EVERY character at the parties and move the lines along while providing the guest something for their memory books. It’s really a shame because guests are asked to pay more and more money for the party, yet are receiving less and less in exchange. When an adult visits a candy stop, they are typically only given 2 or 3 pieces of candy, but pay $70 to 100 for the ticket with only like 7 somewhat rare character sets. Sure, you can ride the rides with little or no wait, but you could do that on the day of the party as well. Well, the rant is over, so here’s the wait times we observed during the 1st party, which wasn’t even close to a sell out. If you hope to meet Minnie/Daisy/Donald, Pooh Characters, Cruella and Queen of Hearts/Tweedles, you’ll be in line a LONG time and will likely need to sacrifice the parade to do so. I can help you with a Custom Halloween Party plan by contacting me with the form below but you’ll still need to be realistic about what you hope to experience as the waits grow longer for popular characters. Previous PostWhat’s the deal with Jasmine’s new costume?Next PostMickey’s Not So Scary Halloween Party Webinar now available for replay! Kenny, my son is wanting to meet Lotso, the queen of hearts and the two tweedles, whinnie the pooh and friends and tarzan should we fit that in to to partys or one? Do you expect any changes in wait times for this years parties? I am going in late September, my first MNSSHP and first Magic Kingdom visit, and my primary focus on characters are Jack and Sally as well the classic characters. I am trying to finalize my plans for the day, but it does seem I will be going to the party solo, so that may help a little bit. I won’t know until tomorrow. I’ll be able to provide estimates then. I had not realized that the first party was already upon us. I am in the final stages of planning my trip for next month, and any information you can provide would be helpful. Thank you, and I look forward to hearing back from you. Hi Kenny! I know I’m planning way ahead but wanted your opinion on the 2017 parties–we are going mid October and can attend MNSSHP on either a Friday or Sunday evening (looking at past years, they have typically had parties those evenings at that point in October). Do you think that Friday will be dramatically busier as locals may attend on Friday as opposed to Sunday, which is a school night? Or should we just go with whichever date fits our plans the best and not consider potential crowd size? I know this is all pretty much conjecture but would love any input you have! Thanks!!! Line usually starts near beginning of their first set. Do you know if Pooh and Friends will be in costume at the Crystal Palace breakfast? We are going to the party, but also have a breakfast scheduled on Oct 31 – would be nice to get that one out of the way early since we want to see them in costume. We weren’t there ON Halloween, but we ate lunch at Crystal Palace the week before on a party day last year and they were in regular Pooh and friends attire. We are going to the Sept 16th party and aren’t interested in seeing any of the characters and are hoping to use the time to enjoy the other aspects of the party and ride as many rides as we can. Other than Peter Pan and Mine train will we be able to get a bunch of rides in? Did the zootopia characters appear before both parades? And were is the best place to see them and dance with them? WHERE* is the best place to dance with them? Thanks for all of your great info Kenny. I saw that the 7D came out early, at about 6:25. Do you think that will be a regular thing this year, or is it too soon to tell? If they do come out early regularly, will you need to get in line more around 5:00? Thanks! This should be a red flag for Disney that they aren’t doing enough with their characters. Especially since the Halloween party has less guests than usual and the lines are 90 minutes long. They got rid of one whole show and they still “can’t” add more characters. Also, it not just the Halloween party, it during regular park hours that they are not doing enough with. The only meet and greet that is a must for us is Jack and Sally. Last year we walked over to Jack’s station around 5pm at MVMCP and we were in and out in 15 min because Jack was already meeting people by that point. I noticed you said 4:30pm line up for Jack and Sally above. Is that because they are starting their meets as early as then? Our plan is to make this our #1 priority for MNSSHP. We are going on 10/2, which is a Sunday. Daughter is wanting to meet all the Princesses is this something that can be done with not using alot of party time ???? This is a great post Kenny, thank you, as it gives people a realistic idea of what they can expect. Went to the Xmas party last year and waited probably almost 90 mins for the Dwarfs. I know it’s a different event but all relative! We didn’t queue when we entered the park as lines were crazy so we waited until after the first parade. The line was still long. After Dwarfs we rushed to go and meet Rapunzel but the CM cut the line, letting the previous 2 people before us in as they said they were with family further down. Gutted! We are going again this year and hope to have a better experience but in reality it will probably be the same. Really hoping to meet Rapunzel and then Pooh this time, AND do the dance parties and see the parade. (Last yr we did 1st parade, Dwarfs,Second parade and Jingle cruise). Hope Disney do something to improve things! I have tickets for the Halloween party. I also have a reservation for Be Our Guest at 4:10. I know you can enter at 4:00. Will that be enough time to get in and get to BOG? Obviously that is a difficult reservation to just change or I would. NOTHING party related will start until 7! Get some riding in before 7. We went last year and only did the party things ( zero rides) from 7-12! It’s really hard to fit a lot in , even with no rides ! What are the two meets that begin prior to the 7pm party time? Are the princes meeting with the princesses? What is the situation for waiting for bracelets? I thought you got these when you entered? We saw crazy lines for these bracelets Friday. Will this be for the Christmas party too? How are the lines for the rides? Also, is Toy Story dance party definitely out for good or just this party? Peter Pan’s Flight and 7 Dwarfs Mine Train are only rides with lines. I’ll confirm Thursday, but Toy Story could be an elimination. Kenny, can you confirm whether or not there were candy stations on the trail between Barnstormer and Space Mountain? The map didn’t list it this year. Thanks! Kenny, there was mention that it rained the first night. Any chance the times will come down a little and that Jack and Sally will meet a little earlier? If there are adjustments to these estimated times, will you update this list? This is our first party so I remain very excited, but also starting to feel overwhelmed given times for waiting in lines. Thanks as always!! Jack and Sally have meet a little earlier in previous years. I’ll check on Thursday and provide an update. It didn’t really rain at the first party. It was drizzling around 6ish until maybe 7. Not long at all and not hard. Jack and Sally did start early but the line was so so long by 4:30 when we passed it. We didn’t get much accomplished. But still enjoyed dressing up and getting treats. We saw the dwarfs, Jafar and Cruella. All after 10pm when the lines were more reasonable. We saw all the shows and did some rides with no wait. I would see the characters later in the evening. It was raining at 5pm when my daughter arrived. She waited at Jack and Sally until they arrived at 5:45pm. Many characters stop meeting before 11pm, so I wouldn’t wait too long. This is really disappointing to hear. Sounds like it’s a divide and conquer with standing in line to meet characters while others in your party ride rides. I really hope I don’t regret spending the money to get in… Thanks for all you do to keep us posted! How long would I expect to wait to see Cinderella during a party? When is the best time to get in her line? Kenny, what time to you recommend getting in line for the dwarfs? Normally I would agree with that, which is what we normally do but we were there on Friday and based on Friday I recommend 5:00pm. The dwarves did come out at 6:25 though which was nice. Eeyore and Friends had the signature cards, but that didn’t really help. Too many parties wanting each and every one in the party to have their own picture taken with the characters. That caused us, and many others, to miss the cutoff time for one of the sittings (only 30 mins per hour, really?!?). As Karen stated above, this is our last party. We’ve been to six total, but the entertainment provided is no longer worth the cost. My family enjoyed the party – the only part I didn’t care for was the 1.5 hours it took to get back to our resort. My wife and I took turns waiting in lines to see as many characters as we could. We were able to see the 7 dwarfs, Cruella, Queen of hearts and Tweedles, Lotso, Jafar, Aladdin/Abu, and Jasmine/Genie before the kids got tired of seeing characters around 10:00. The kids rode a few rides and trick or treated while we waited in lines and saved a spot for the parade. I’ve been doing these parties since like 2009. I missed 2015/2016. But from the looks of things I haven’t missed out on much. Being completely honest here, knowing how these parties work, the offerings at MNSSHP are still plenty bountiful. I’ve always held the Parade and Fireworks show were the two best on property. This includes the Christmas versions, just my opinion. Plus , I have never seen the Halloween version of Celebrate the Magic, so excited for that. With the advent of the Villians Event in HS, ya kinda gotta figure that the MNSSHP will suffer,character wise. I’m sure Disney thinks, “What’s better than one private event that we can charge park goers to attend and meet rare characters?” My answer would be two. The party in MK and the dance party in HS. If you went and met the same people in MK , why go to HS and pay. Don’t get me wrong, I’ve met em all, and there is no way in @$!# , that I’d pay to meet those characters in HS, for that price, without a parade,fireworks, or random candy to entice me. I always plan to at least 2 parties per season . 1 party for the characters and trick or treating and the other for shows fireworks and to clean up any characters I missed the first time around. I don’t mind doing the whole lining up early, better to waste non party time than be stuck all night in lines. Sure, do I have my gripes about the Halloween party. I miss the mix and mingle show. I preferred the one before Facilier took over. Also, the flag waving pirates replacing the pirate/wenches dancing sucked in my opinion. Nothing though enough to lure me away from going. As long as there’s the Dwarves, Jack/Sally (who were a huge add a few years back), Lotso, The Cadaver Dans, and Boo To You and Hallowishes, I’ll be a staple at these things for years to come. I agree about the fireworks and parade. They are my absolute favorites. Do you think Disney took villains away because they want people to pay for the villains party at HS? This seems like what they have been doing lately, take something away that was free and charge extra for it. I’m ok with pre made cards for special event photos/autographs it dies save time in those lines and you still get the autograph. Sad that it seems to keep getting smaller and less special – the dance parties were one of our favorites and those special characters is what makes it so cool! How long to meet the Madames at Haunted Mansion?? No headless horseman!! Boo hiss!! Did he ride the second parade? We were on Main Street for the first parade and didn’t see him. a CM said he wasn’t scheduled so we left before the second! We were sitting on main street @ 8:10 we never saw him. We also found the lines to be crazy. We’ve done multiple parties every season since 2010 and I did wonder if my perception of the whole thing was just skewed over the years, so it’s comforting to see that my memory is not playing tricks on me. I also agree with what some of you have said about the candy. Daughter and I have always enjoyed going through the trails and collecting candy. Lines were insane at the beginning of the evening. more so than we experienced even at previous sold out parties, which strangely never felt as busy as this recent one. Also noticed them with a handful of candy actually putting some back in the bin as soon as adults approached them, giving the grown ups a couple of pieces at best. It gives off a message that Disney is for kids and the adults tag along for the ride. I’m certain this is not the way they want it to be perceived, but for those who have attended parties in the past and have a bar for comparison, it was blatantly obvious. Even our daughter picked up on it right from the first line. Were people able to dance in the street with the Zootopia characters? There was a conga line on main Street b4 the parade and kids were asked to participate. I told my 4 year old to go grab Judy’s hand and I was able to steal some shots b4 a cast member shooed my daughter away. Nick and Judy with Creepa Crew. Posted recently about that. I totally agree that rare characters should have signature cards to give out, instead of signing autographs. On “Photopass Day,” the Magic Kingdom special characters had a signature card, and the line went pretty well. But at EPCOT, Mulan/Mushu didn’t have a signature card, and the line was 2-3 hours long throughout the day. I complained at EPCOT guest relations about it. Maybe if enough people say something, Disney will listen. Hope someone from Disney is reading this. We were looking forward to the Toy Story dance party. Only makes sense to have Villains at a Halloween Party. An expensive party to boot! BOOOOOO! My kids are dressing as Toy Story and were looking forward to the dance party. Was there a reason it was cancelled. We were at Fridays party, my kids were buzz and woody. EXTREMELY disappointed there was no dance party with bullseye! How long was the line for Buzz/Lotso and Tarzan/Terk? I really hope we don’t end up disappointed. We read everywhere on the net how jam packed with events, dancing, and overflowing candy it was, that we splurged on two party nights for our trip. Are they stingy with the candy? Are we going to be disappointed that we are going two nights? Also, I saw on your touring plan that it was okay for me to hold a place in line (to meet the seven dwarfs), while my husband took the littles to ride rides. Is that okay?! And what time should I line up? They are the main characters I would like to meet! Saw a photo of some kids with their candy haul and whilst it looked loads like usual the selection and variety was very limited and 70% contained peanuts. Kenny, I’m looking for that recent post an how they’re handling food allergies. Will you please help me locate it? I saw the post about the new, fantastic treats for the party but don’t recall it bein fb listed there. Thank you for all your very useful info. We’ll be at the party later this month. 1st time, hoping we won’t be disappointed. I stood in line while my wife and daughter rode barnstormer, dumbo and got treats in storybook circus. We lol I waited from 615 till 745 to see them. I attended two years ago and found out you can get additional candy at City Hall. Also, if you have special dietary needs, you can get a bag from City Hall. My son is diabetic, so we will be looking for apples, raisins, and sugar free candy. You can do it. I had to do it with my daughter she has Aspergers & ADHD. It’s a shame they’re not putting rarer characters out there in mass. If this is your first party……….there is some value, even with the wait………..if not……….I get the point. On Friday, we were in line at 4:40 for Jack and Sally (we were stuck on a long line to get our bracelets) and we saw them by 5:30. I specifically made a note of it since I wasn’t sure what to expect. I saw the super long line for tweedle dee and tweedle dum and passed since it was REALLY long. The 7 dwarves line was crazy too. We ended up going around and got Magic Shots instead. As far as candy, there are two in fantasyland in Pete’s Silly Sideshow. Each side had 3 candy stops and we went again right before 12 and they gave us multiple huge handfuls. Other stops earlier were pretty stingy. If you get to the park by 4, go to the Halloween specific entry lines. When we went, they were not marked and were on the right hand side. We didn’t know until we were through and then had to get into a separate line for our bracelets in tomorrowland which took much longer than it would have at the entrance. Wow !!!! Thought this was a Halloween Party we have been going for years and the reason for that was to meet and greet the Villains !!!! So why is Disney doing this ???? We only waited for an hour to see the dwarves, but that was at 8:30. As we queued, they estimated wait times at half an hour. But we knew better. Where are the dwarfs meeting? I’m thinking of getting in line for them around 5:30?